Tonight I finally caught up with Mr. and Mrs. Ho. I missed them on my last trip to Singapore, and by now they have moved into their beautifully restored conservation shop house, so I got a chance to see what 3 years of work (not to mention tons of mullah) looks like. One of the places I was dying to go back to on this trip was Candlenut, and as it turned out, it was just walking distance from their house! I was a little apprehensive about bringing Mrs. Ho here, because she loves Peranakan cuisine and I wasn't sure she would take to the more modern adaptations from chef Malcolm Lee. I figured that Mr. Ho, on the other hand, would probably just happily lap most things up, and I was right! Turmeric wings - really crispy and awesome wings. Sooo tasty, except... neither Mr. Ho nor I picked up much of the turmeric... although I did notice a yellow hue underneath the skin. Sweet potato leaves - we asked for "no spice" but was expecting it to be stir-fried plainly. Judging from the amount of garlic, I'd say that was anything but "plain". But we all absolutely loved it. Sambal "choking" sotong - apparently this was named "choking" because the kitchen staff would choke every time they cooked it... Really, really good, and a dish that all 3 of us rated very highly. Loved the combination of spicy and tangy flavors, which were definitely a little sharp. One could imagine that this was done at high heat, but the squid still came out extremely tender. Love the little cherry tomatoes. Lor bak - a last-minute decision to switch from crispy pork belly to this. The braised pork jowl was tender and reasonably tasty, but for me this was more like a homey dish - something I could imagine mom making - so it did now wow me. It's more of a comfort dish for me, which still says a lot. Buah keluak with F1 Ranger Valley Wagyu (MBS 7+) beef rib - had to have this again. Very, very tender beef. And once you scoop up enough of the sauce, the flavors of buah keluak would definitely win you over. French duck breast rendang, grilled and served pink - I was not the least bit surprised to find Mr. Ho eager to try this option. I was also most curious. While this turned out to be the favorite for both Mr. and Mrs. Ho, I deducted some points for the texture. While the breast was indeed pink, I felt it was just a little bit more chewy than I preferred. For the first couple of slices, I failed to cut it with my spoon (duh...) and ended up shoving the whole slice in my mouth. Not so great. After we asked for knives and cut the slices in half, the bite sizes became more manageable. Flavor-wise, though, this worked extremely well. The smoky flavors of the charred skin blended seamlessly with the spicy, complex flavors of galangal, turmeric, cardamom... This is where I give credit to Malcolm to even think about using non-traditional ingredients as alternatives to beef. We were pretty full, but the real reason I came back to Candlenut was actually the desserts! I made sure we picked the three which were my favorites from last time. Chendol cream - hello babe, I love you! Even though I had already gotten my chendol fix at a hawker center earlier in the day, this was what I looked forward to the most tonight. That soft, wobbly panna cotta-like coconut custard pudding, with the beautiful fragrance and sweetness of gula melaka. Next time I'm here, I'm not sharing this with anyone. I want one of my own. Durian soup - oh yeah, it's nice to see you again, too! I'd already gotten a dose of durian (along with my chendol), but I sure wasn't gonna pass this up! I think I made Mrs. Ho pretty happy. Buah keluak - further evidence of Malcom's cojones. I ordered this for Mr. Ho since he loves buah keluak. Very rich and heavy, which was why I saved it for last. Love the combination of flavors, including salted caramel. 2006 Dr. Loosen Erdener Prälat Riesling Auslese - marmalade, apricot, a little bit of petrol. Fairly sweet on the palate, with some acidity. 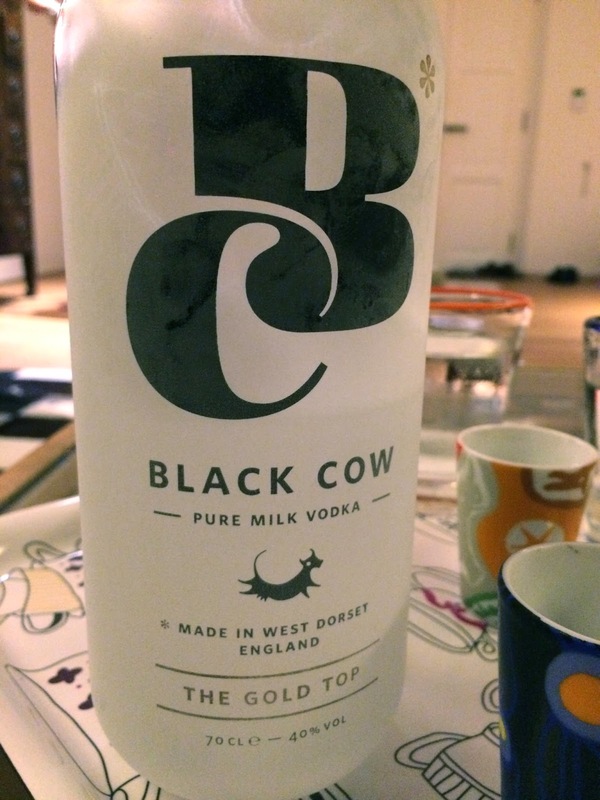 We adjourned back to the Ho residence since it was still early, and they introduced me to Black Cow Pure Milk Vodka, a vodka made by distilling a milky beer brewed with whey leftover from making cheese out of milk from grass-grazing cows in West Dorset, England. Now THIS was interesting. I normally don't drink vodka because all I taste is the very strong and sharp alcohol, but there was something more to this one. If you take a sip but don't swallow immediately, and kinda roll the vodka around the mouth with your tongue... you should start to feel the unctuous texture, and interestingly there is a certainly creaminess in terms of flavor profile. It felt like I was tasting a very diluted yogurt drink, and this was coming out of a distilled vodka... It kinda blew my mind a little. I poured a little into my shot of espresso, took a sip and did the same twirling with my tongue. Interestingly, the addition of that little bit of vodka also seemed to make a difference in the coffee's texture. Many thanks to Mr. and Mrs. Ho for such fantastic company, and I look forward to catching up again soon! this looks amazing!! thanks for the tip, heading back home in 2 weeks and looking forward to eat here! !